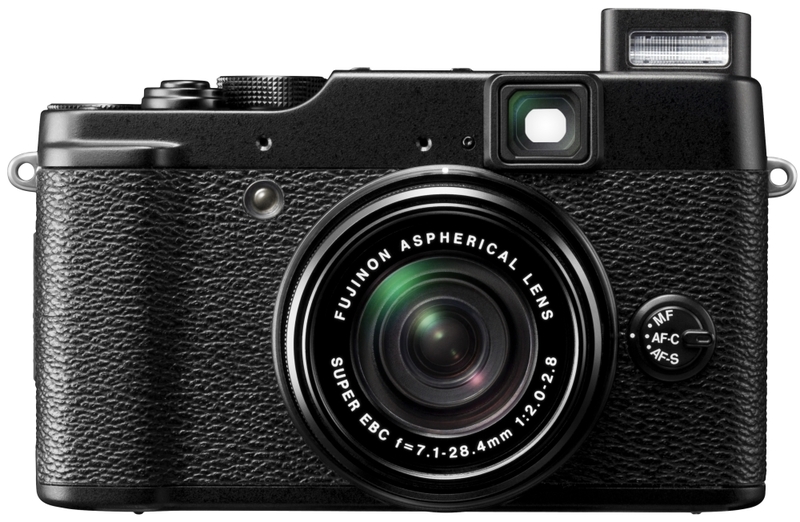 Fuji has created a superb prosumer camera with their FinePix X10. Overall it comes highly recommended from the staff at Steve's, however be sure to check out our Pros and Cons lists above to see if the X10 is right for you. It offers great bang for your buck, but it is on the higher end of the pricing scale - and it's well within the price range of entry-level dSLRs and EVIL / ILC cameras. Read more in our Full Conclusion. Following in the award winning footsteps of the X100, Fujifilm has created the FinePix X10 digital camera. With its die-cast magnesium alloy body, the X10 features a newly developed 2/3-inch 12-megapixel EXR CMOS sensor which is able to automatically detect optimum shooting mode from 99 variations. Such shooting modes include High Sensitivity and Low Noise (for capturing night scenes), Wide Dynamic Range (increases dynamic range up to 1600%), and HR (High Resolution), which is "perfect for bright clear days." Fujfilm's proprietary EXR technology also means speed. It features a 0.01 second shutter lag time, a 0.8 second Quick Start Mode, and up to 7 frames per second of continuous shooting at full resolution (up to 10 frames per second at a reduced resolution). The X10's FUJNON 4x manual zoom lens (28-112mm), has been treated with Super EBC (Electron Beam Coating) and consists of 11 glass lens elements in 9 groups. It has a wide angle maximum aperture of F2.0 and a maximum telephoto aperture of F2.8. The optical glass viewfinder has an extra wide 20 degree viewing angle, and if you there's also a 2.8-inch LCD display. Fujifilm's FinePix X10 has a diverse collection of both automatic and manual modes. Advanced shooting modes include Program, Aperture Priority, Shutter Priority, and full Manual. There are also four auto bracketing functions for ISO sensitivity, exposure, film simulation (of which there are 8 settings), and dynamic range. To maximize image capture quality, the X10 shoots in the RAW format and features in-camera RAW processing (also, SilkyPix RAW conversion software is included in the box). The X10 also records movies in Full HD 1080p and has a fun mode called Motion Panorama 360° for creating in-camera 360 degree panorama pictures. Lastly, if you ever find your self leaning a few degrees to one side or the other, a built in electronic horizon leveling gauge may be a feature you'll be using frequently. LC-X10 Leather Camera Case. "Quick shot" retro styling. LH-X10 Lens Hood with adapter ring. Compatible with 52mm filters and lens caps. EF-20 and EF-42 Fujifilm External Automatic Flashes. The FujiFilm FinePix X10 has a retail price of $599. See our buy box below for the most current online pricing.